Planning a cake smash? Why not personalise them with our latest smash cake prop package? 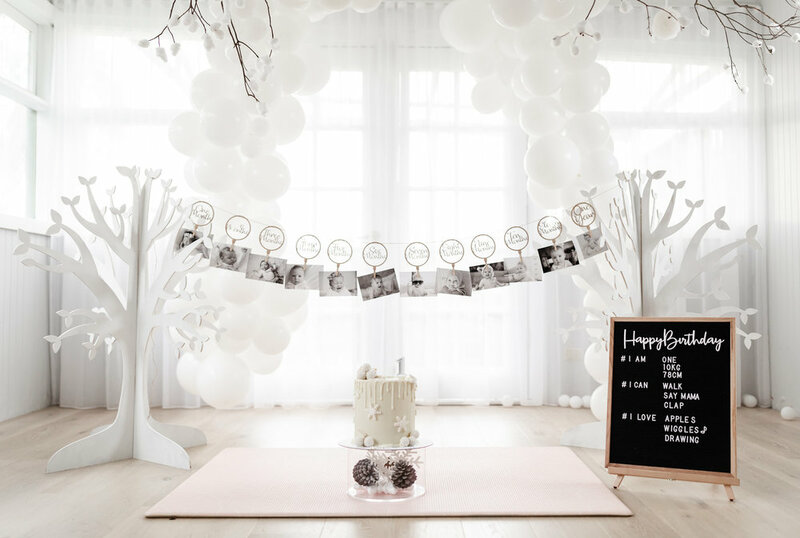 The Smash Cake Package is designed for busy mums who are thinking of doing a smash cake Hire both of our magical white trees as your perfect smash cake backdrop, along with your very own 12 month banner attached with your little one's photos. Email us your child's name and milestones and we will personalise a milestone board for you! Wait, it doesn't end here! How about a fillable acrylic cake stand that can be filled with any items that suits the theme of your party? Lions and Giraffes for a wild one party, unicorns and fairies for a magical themed party, or keep it simple with some sparkle graffitis? Finally, An acrylic "1" cake topper and wipeable mat also comes as a complimentary item to your smash cake package to complete the entire scene.